Dr. Alejandro Kovacs, an accomplished periodontist in Longview, TX, recently attended the ICOI (International Congress of Oral Implantologists) World Congress XXXV in Vancouver, BC. During the event, he received ICOI Diplomate recognition for showing his commitment to excellence in the field of implant dentistry. 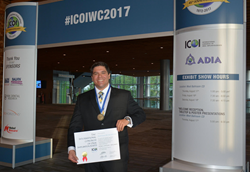 Dr. Alejandro Kovacs is a dual-certified prosthodontist and periodontist in Longview, TX, who was recently recognized as an ICOI (International Congress of Oral Implantologists) Diplomate at the ICOI World Congress XXXV in Vancouver, BC. Showing his superior skills and knowledge in simple and complex cases in implant dentistry and a commitment to implementing the latest in implant techniques and technology, Dr. Kovacs is honored to receive this recognition. For the last 35 years, the ICOI World Congress brings industry leaders together to offer dental continuing education courses covering the latest in implant dentistry. Dr. Kovacs brings this experience to his practice, Pinnacle Implants & Periodontics in Longview, TX, in order to offer patients in need of dental implants, lasting, minimally invasive care. The ICOI was founded in 1972 and is the largest dental implant organization in the world. It is composed of general dentists, prosthodontists and many other oral care professionals. It is also composed of researchers, auxiliaries and the general public. It is currently the largest provider of continuing dental implant education in the world. This year’s event provided numerous courses instructed by leaders in implant dentistry. As a trusted periodontist in Longview, TX, Dr. Kovacs is proud to be recognized as an ICOI Diplomate as a direct result of his dedication to excellence in the field of implant dentistry. In order to receive the prestigious ICOI Diplomate award, candidates must receive advanced training in implant placement and a complete rigorous examination that tests superior skills and knowledge in both simple and complex implant dentistry cases. Dr. Kovacs is a board-certified periodontist and prosthodontist who offers a variety of specialized services at his practice. These services include laser periodontal therapy, dental implant placement, full mouth reconstruction, emergency care and many others. He also offers sedation for patients who have dental fear and are anxious about receiving the care they need. His goal is to help patients remain as comfortable and relaxed as possible while providing them with leading oral care. Dr. Kovacs, a skilled periodontist in Longview, TX, encourages patients with gum disease, missing teeth and other oral problems to visit his practice for a custom consultation. Appointments for dental implants, laser gum disease treatment and other services can be scheduled by calling 903-758-3329 and speaking with a Pinnacle Implants and Periodontics team member.